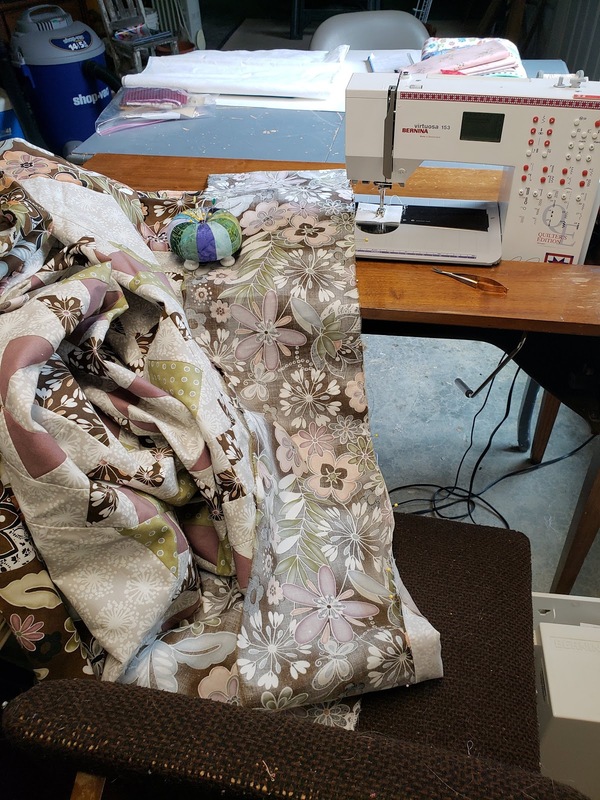 Knitty Quilter: All things quilting and knitting ... you know, what floats my boat! ... just not very quickly. I suppose I should be happily stitching but I'm sensing the end of this Mosaics project. Besides I love the applique part of EPP so much more than the stitching them all together. Oh well, I suppose one must have a little rain to appreciate the sunshine. I went from this photo on the left of the diamonds laid side by side to the photo on the right of the diamonds tacked together. This morning I woke up around 2am with the awful feeling that I didn't have enough of my background fabric for the diamond borders plus the cornerstone hexie globules. That's what I call them anyway. I guess it would be nicer to call them the large clusters. Anyway, after tossing & turning for a bit, I went to my sewing space and measured. Sure enough, not enough. Then I looked at the pattern and saw that the borders weren't as long as I was thinking. Hooray! I have enough fabric. I believe I actually have JUST ENOUGH FABRIC! Pshew! So what did I do? Do you think I started cutting the borders so I could get right on to appliqueing those diamonds? Nope!!! I had actually started sewing on the first borders of my APQ 2018 UFO Challenge yesterday afternoon! I know! Who would have guessed! I had gotten started while doing laundry but got interrupted while sewing on the second border due to Jeopardy coming on. I ♥ Jeopardy! So anyhow, I now have 3 whole borders sewn on Blowin' In the Wind and the last side pinned. Again, why did I stop? Because I could hear the 4:30am alarm going off for Husband to get up for work. Another stopping point to go make his lunch and scoot him out the door. But that's OK ... this quilt top is close to done and is at a point that's so easy to pick up and finally finish it off. Linking up with Anthea for Piece Yourself Together at Hibiscus Stitches. 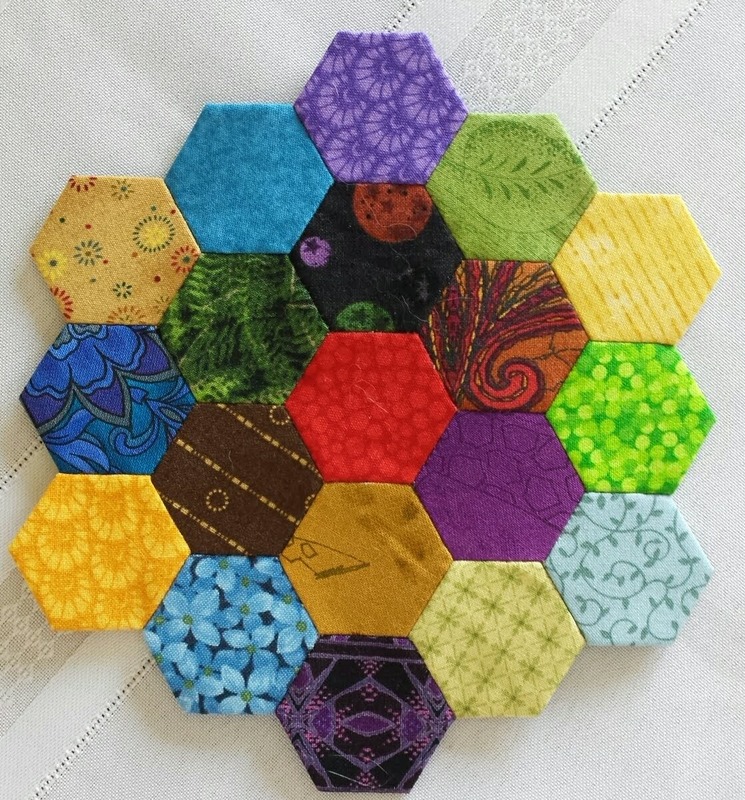 You should check out the itty-bitty hexies she's working with. I'd need stronger glasses, I'm afraid! 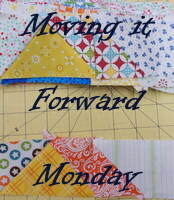 Linking up with Anthea of Hibiscus Stitches this morning which is actually evening in beautiful Australia. Piece Yourself Together is keeping me in line for getting my Mosaics to a finish. I had neglected it a bit and Anthea has given me motivation once again to Keep.On.Stitching! Just look what I've accomplished these last two weeks! 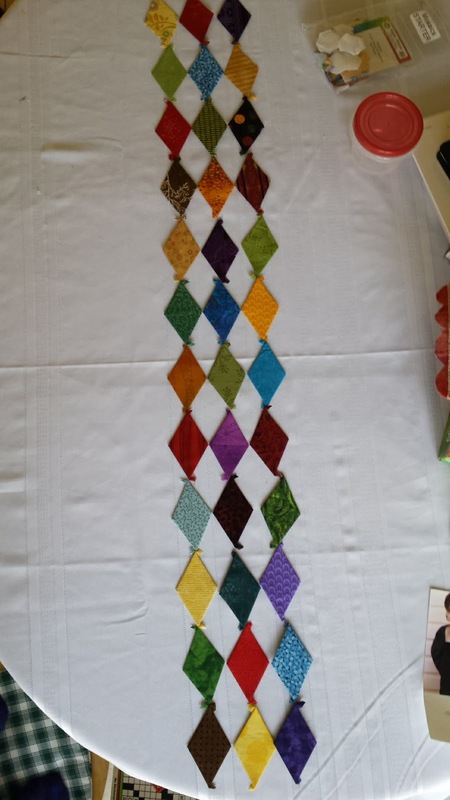 Thirty-six diamonds prepped and ready to be stitched together and then appliqued down to the outer border This final border has hexie cornerstones. Here's the first one completed. During guild meeting last night I managed to get a good start on the next one. Did I mention that I also got all the hexies prepped and organized, ready to stitch them into their final configurations? Yes, I did all that! As for APQ 2018 UFO Challenge, March's number was 3. I believe I mentioned that I got my border fabric starched earlier. That was my entire March progress. Pathetic! Well, for April the number pulled was 5 -- Float! Perfect since I really ought to concentrate on March's #3, Blowin' in the Wind. The other day I actually pulled it out, ironed it, and got it measured. That's the first step for borders. I then ironed the border fabric and started measuring it. I actually got the two long sides cut. Just need to clear a space on my sewing machine to sew it on. It's 85" long and will be heavy if I don't have room to rest it. In case you forgot what this top looks like, here's a refresher picture. While pressing the top, I was trying to figure out how I was going to quilt it. Pretty sure I've got plenty of time to contemplate that one! Ha! That's enough for today. If you'd like to see what some of the rest of us have been up to, visit Hibiscus Stitches and click on the links on the right hand side of the page. Thank you, Anthea, for the incentive to keep on stitching!